Hyosung in India was quite for some time till today. The manufacturer hasn’t showcased anything or isn’t launching anything this year by far when it comes to new products. THe motorcycles and cruisers are as it is and the company has finally done something to begin with . The DSK group is also responsible for Benelli which the brand is aggressively focusing on. Moving on, DSK Hyosung have just launched their quarter-litre cruiser, the Aquila 250 in three new colours. 2017 Hyosung Aquila 250 Limited Edition will be sold in an exclusive manner as only 100 units will be available across all dealerships. 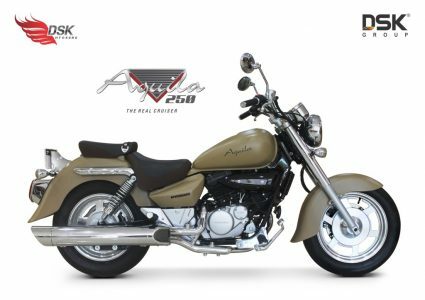 2017 Hyosung Aquila 250 Limited Edition cruiser bikes will be available in Matte Green, Carbon Black and Desert Brown colours. The overall styling though is severely dated and it could use a new update which was showcased last year for its elder sibling. Chassis wise, telescopic suspension at the front and hydraulic shocks at the rear are here like before. Brakes are disc at both ends. The fuel-tank has capacity is 14-litres. The riding position continues to be typical cruiser which is comfortable with front-set footpegs. The Completely Knocked Down unit (CKD) and is assembled at DSK Hyosung’s facility at Pune. Priced continue to be Rs 2.94 lakhs (ex-showroom, Delhi). DSK is offering loans on its bike with various attractive schemes. 2017 Hyosung Aquila 250 will continue with the same 250cc, 4-stroke, V-twin oil-cooled engine. The motor produces 26.5 PS at 9500 RPM and 21 Nm of torque at 7500 RPM. The engine is mated to a 5-speed gearbox. There is no ABS or CBS on offer for now. Feature includes a speedometer, tachometer and other essentionals and tell-tale light on offer in the instrument cluster. First Ever Royal Enfield Advert Goes Viral and The Nostalgia is INTENSE!